The purpose of the event and this article is to get trees planted for koalas on private land – urgently. This event and the data presented are specific to the You Yangs / Little River / Western Plains region of Victoria, but much of it will be relevant to other regions. See below for a list of other organisations doing koala tree planting. We acknowledge the Traditional Owners of the land we live, work and plant koala trees on – the Wathaurong People. 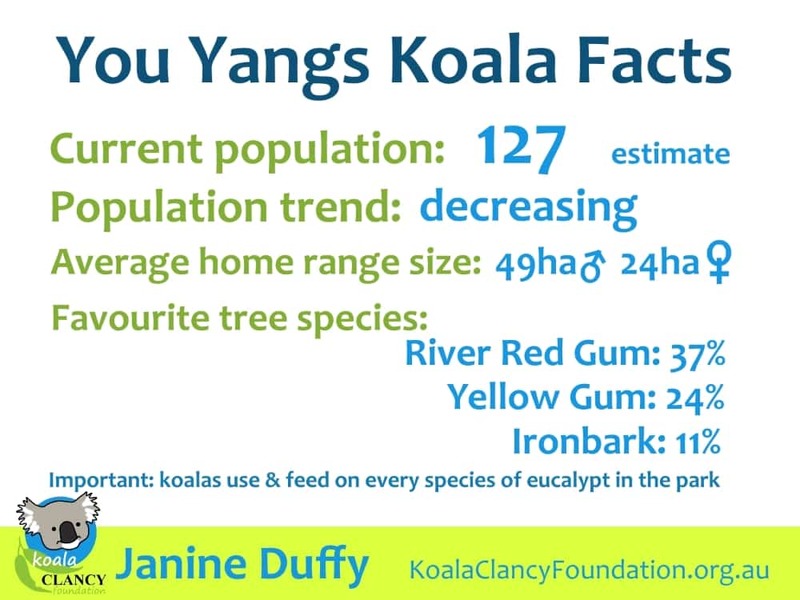 The presentation is in two parts: background information about the local koala population of the You Yangs region; then information about what Koala Clancy Foundation do and how everyone can get involved. 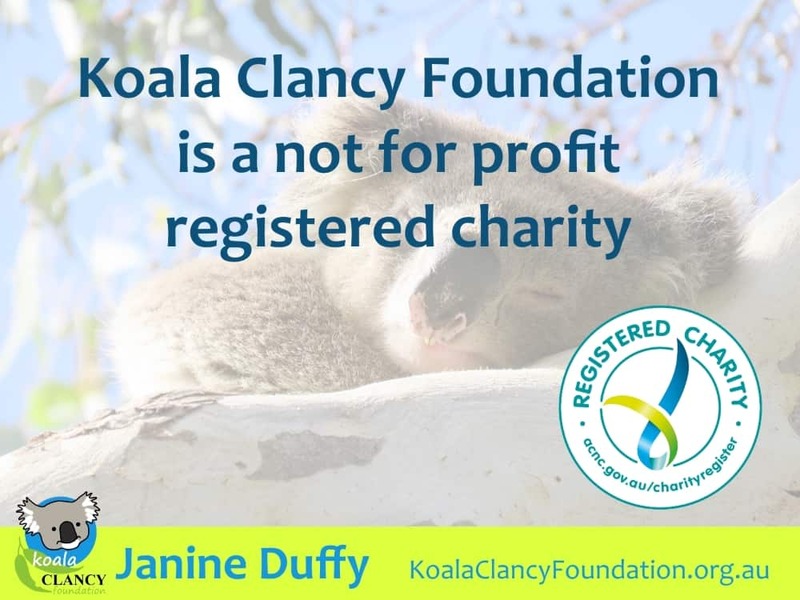 Koala Clancy Foundation is a not for profit registered charity. 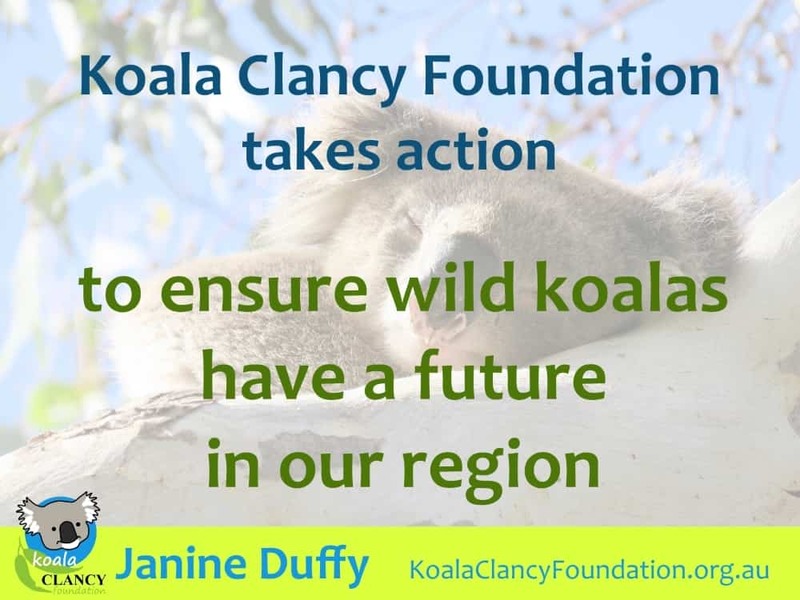 Koala Clancy Foundation takes action to ensure wild koalas have a future in our region. 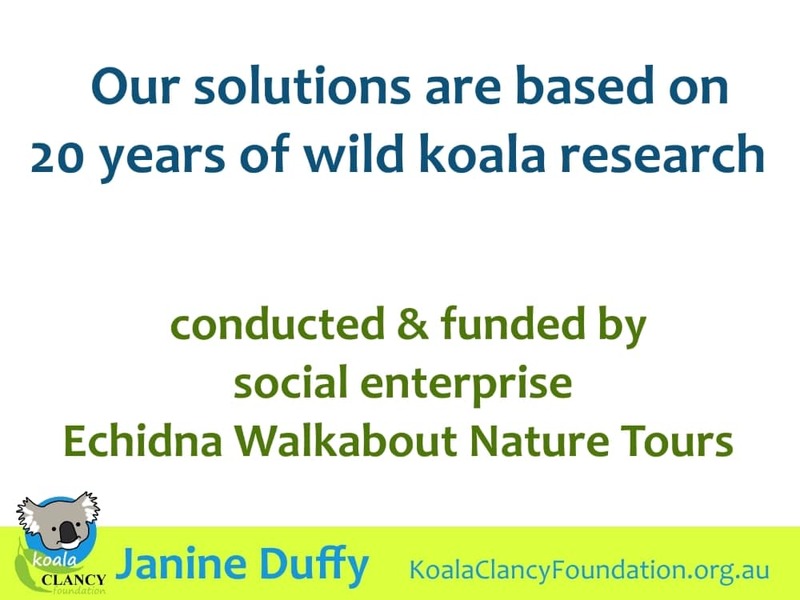 Our solutions are based on 20 years of wild koala research conducted & funded by social enterprise Echidna Walkabout Nature Tours. Its urgent that we act now to save local koalas. Koala numbers halved in the 10 years to 2017. The Millenium Drought caused a rapid decline of koalas in its 12th, 13th & 14th year. We lost one third of our koala population in the summer of 2009/2010. The rain returned in 2010, and the population started to recover – but as the graph shows, not enough to return to pre-drought levels. And now they are declining again. Update 1 December 2018: Another koala has appeared in our research area in the last weeks, so the last column on the graph (2018) is looking a little better now with 11 individuals, not 10. 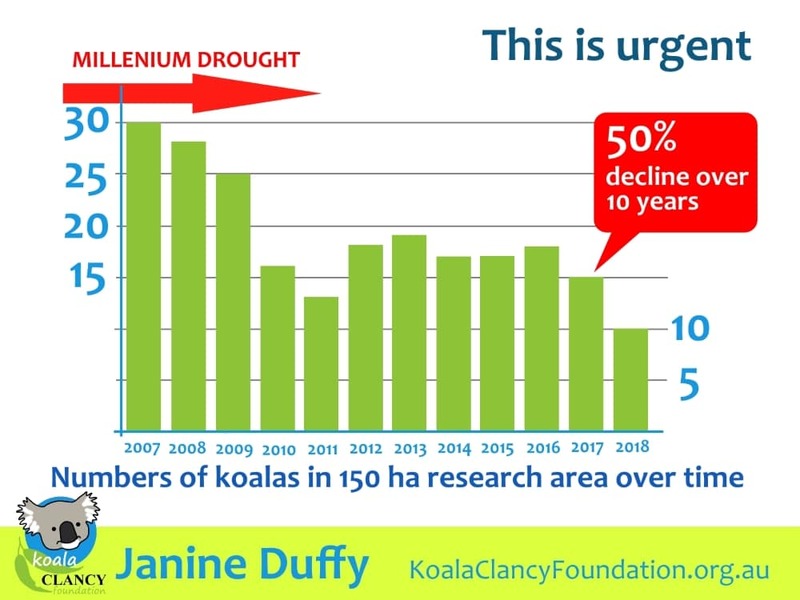 More detail about the koala decline and millenium drought in the You Yangs. The trees are too dry in the You Yangs. 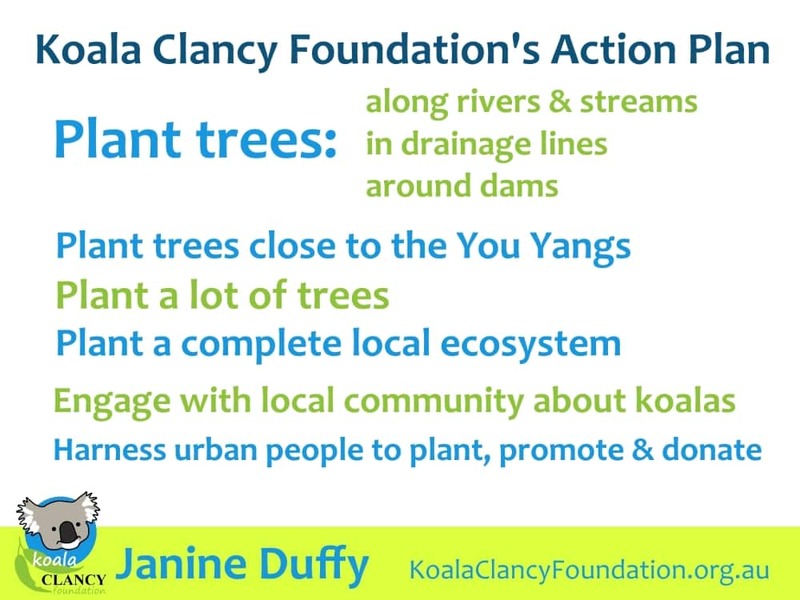 The purpose of this blog is to get trees planted for koalas on private land, which is the majority of the land around the You Yangs. Read why koalas need farmers. • Plant the correct local ecosystem. Koalas need more than just food trees, and non-food trees & shrub can improve success for food trees. We also need to engage with local community about koalas; and harness the power of urban people to plant, promote and donate. Population trend is decreasing critically. (6) (note: a population decline of 50% over 10 years where the cause has not been rectified would classify koalas as endangered in this park). Koalas need a lot of trees, more than most people think. 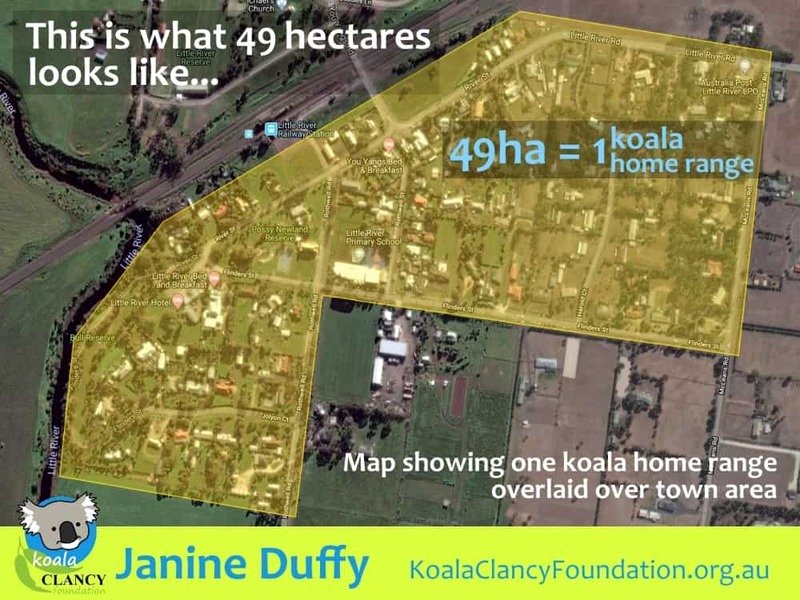 To get an idea of what 49 hectares look like in real terms, an average male koala home range would cover the whole built-up town area of Little River. Luckily, koala trees can grow fast. It only takes 5 years to grow a tree big enough to feed a koala. (5) Especially when the right species of tree for the area is planted in rivers, creeks and drainage lines, where koalas need them most. Melbourne Water also support native tree plantings along waterways. Find out about their stream frontage grants here. For many years, landowners have done a lot of effective tree planting themselves – much of it with top notch support and advice from Landcare. But landowners don’t have to do it all – let’s get urban people to help! Many people with city jobs are keen to spend a day volunteering in nature. Environmental volunteering is one of the fastest growing volunteer sectors in Australia. 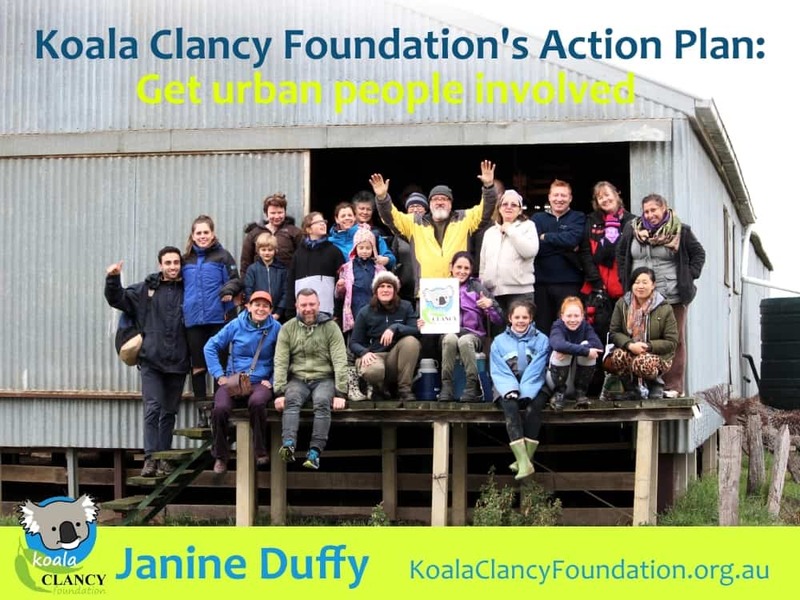 Urban people volunteer with Koala Clancy Foundation for wellness, to socialise with and meet like-minded people, to learn about koalas and to give back. So let’s get started – koalas need us now. Part 2: How everyone can get involved. • koala tree species advice & selection. We are experts on the right woodland species for the local area. • pre-tree planting meetings on site – as many as you need to feel comfortable. • assistance with grant applications to cover costs of hole-digging, fencing, tree guards and stakes, tree seedlings. • days to suit you from June to August. We run koala tree planting days on weekdays and weekends. • 15- 25 motivated volunteer planters. 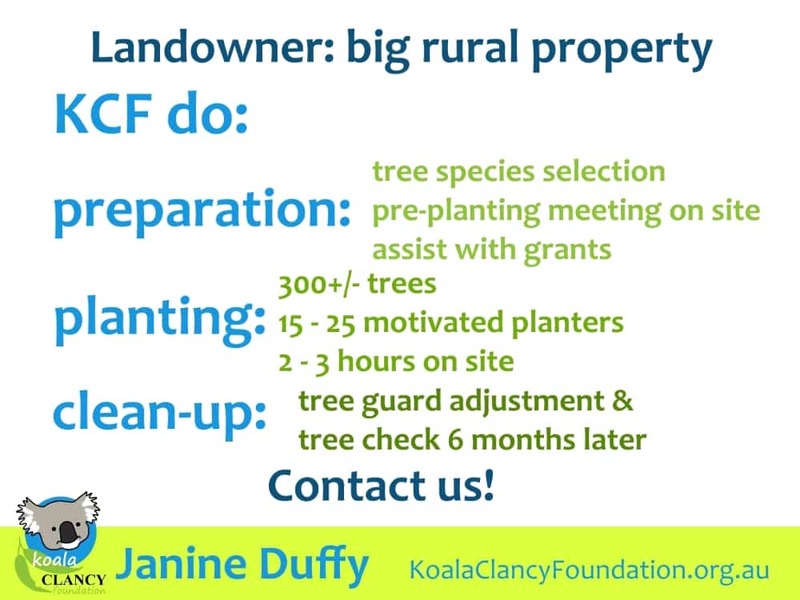 Many are members of KCF with tree planting experience. All groups are supervised by a KCF staff member. • 300+/- trees, 2-3 hours on site. Its not a long day or a lot of work for the landowners. • privacy & biosecurity is paramount. We want you – the landowner – to be there on the day, to ensure we drive only where you want us, to respect biosecurity and privacy, to oversee our time on your land. • cleanup/adjustment of tree guards & tree check 6 months & 1 year later – if you don’t mind. • Our success rate is very high! 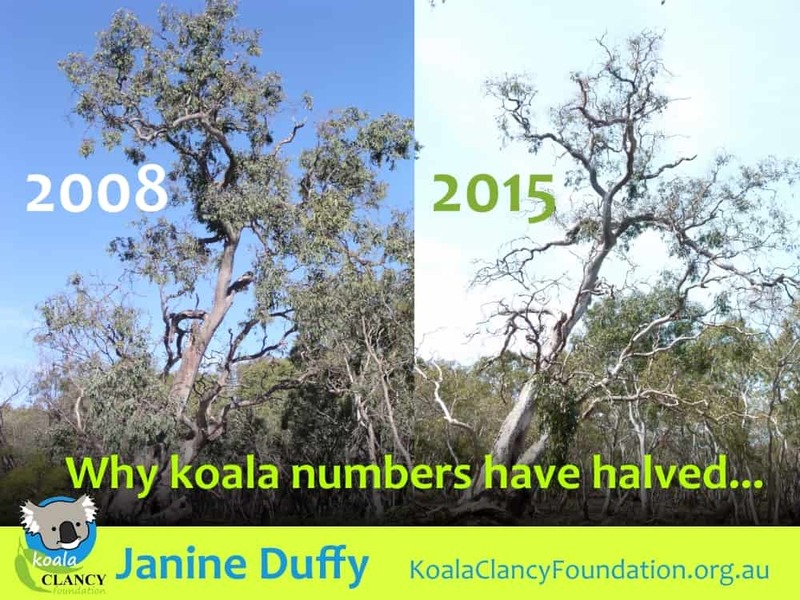 We have already planted over 5,000 koala trees in 2 years and the success rate has been 80-90% survival so far. This is due, we believe, to expert species and site selection and quality planting methods. If this is you, please contact us. If not, don’t worry everyone can help! Small property owners: team up with neighbours so that we can plant 200 to 300 trees in a block on one day. Volunteer: to help us plant, either on a Koala Conservation day for Locals, or get your own group together on a day that suits you. Koala Conservation Days: all welcome! run Sundays all year. 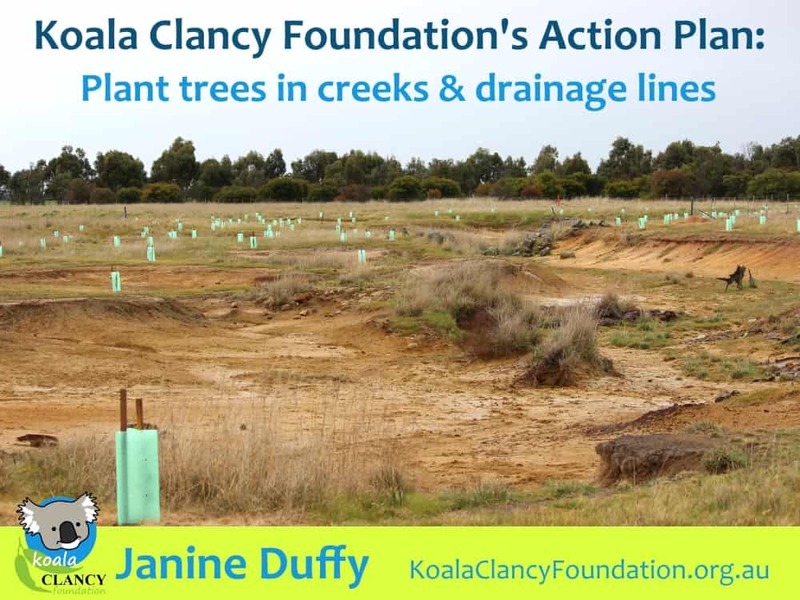 Planting happens on public and private Koala Conservation Days from June to August. 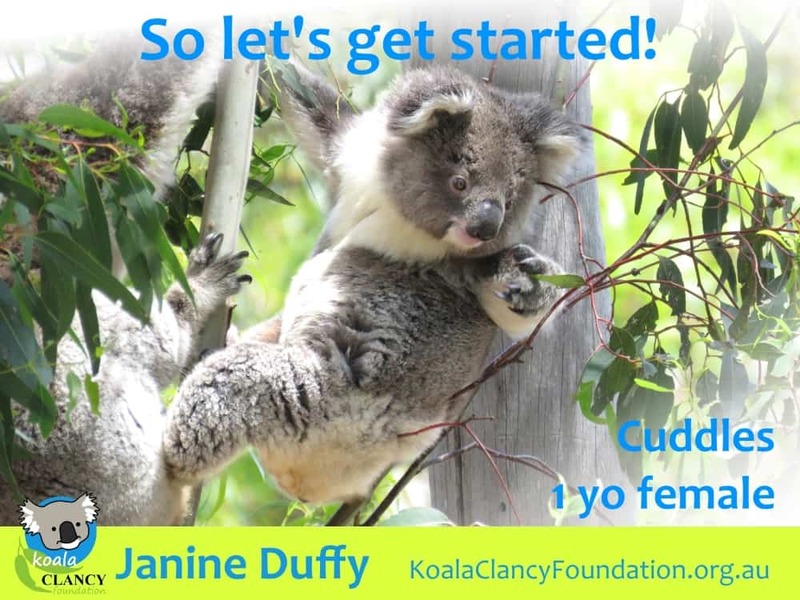 Become a member of Koala Clancy Foundation. 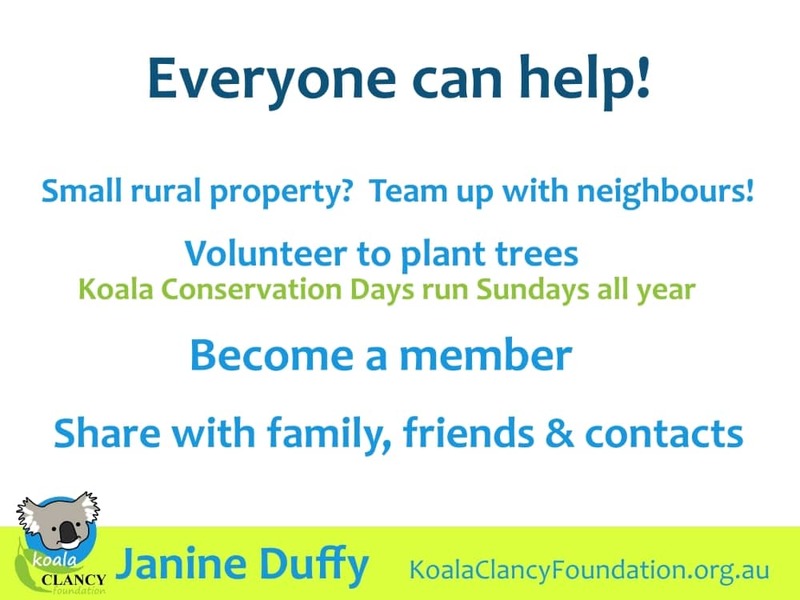 Share our events with family, friends and contacts: Koala Clancy has a big following! Let’s get these trees planted so that Clancy, Lluvia and Cuddles can survive. Thankyou so much for reading this blog. If you could share, that would be fantastic. Thanks to Geelong City Councillors Ron Nelson & Jim Mason; Lloyd Stanway from Melbourne Water and David Tsardakis from Landcare who attended and gave support to the event. Thanks to all the Koala Clancy Foundation team and members who helped out. Thanks to Echidna Walkabout Nature Tours for providing funding and koala research. 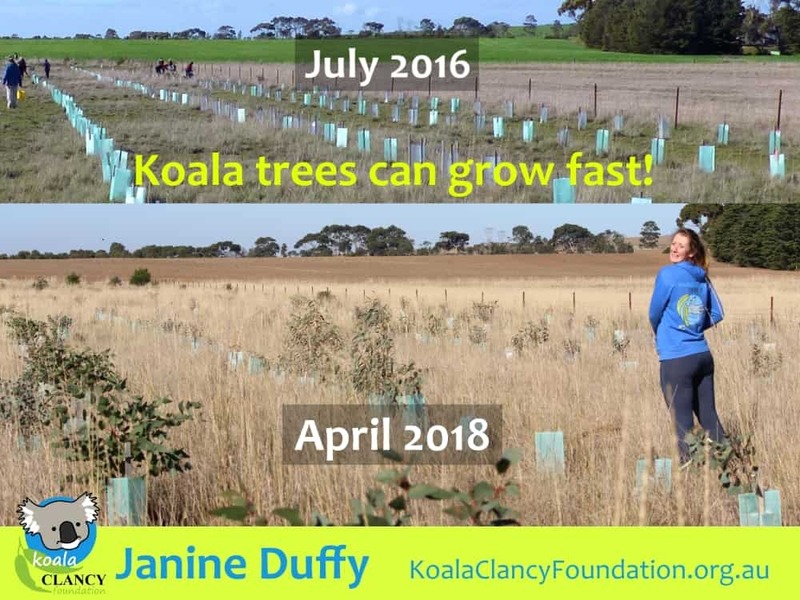 Without the support provided by this social enterprise wildlife tour operator, this koala tree planting could not happen. Thanks to local newspaper Wyndham Star for this article about our event. 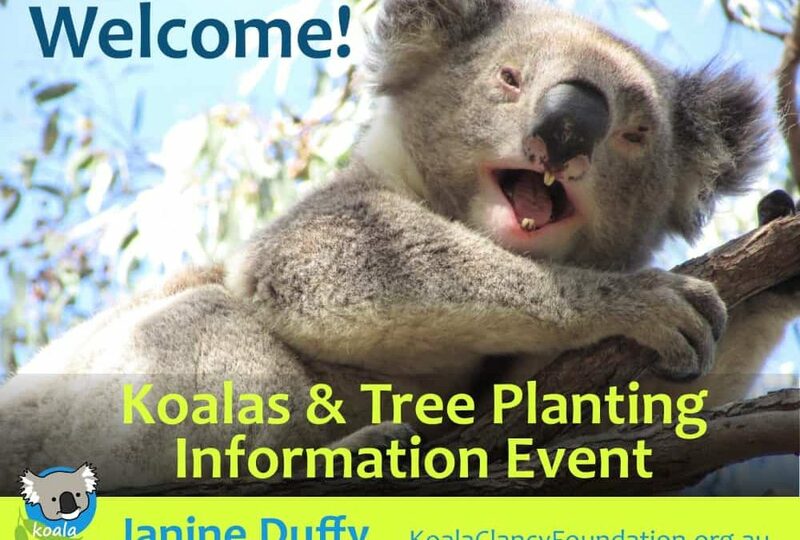 Koala Action Group Qld: runs regular tree planting days. 1) Davies NA, Gramotnev G, McAlpine C, Seabrook L, Baxter G, Lunney D, Rhodes J, Bradley A (2013) Physiological Stress in Koala Populations near the Arid Edge of Their Distribution PLoS ONE 8(11): e79136. 2) Sullivan BJ, Baxter GS, Lisle AT (2003) Low-density koala (Phascolarctos cinereus) populations in the mulgalands of south-west Queensland. III. Broad-scale patterns of habitat use. Wildlife Research 30: 583–591. 3) Seabrook L, McAlpine C, Baxter G, Rhodes J, Bradley A, et al. (2011) Drought-driven change in wildlife distribution and numbers: a case study of koalas in south west Queensland. Wildlife Research 38: 509–524. 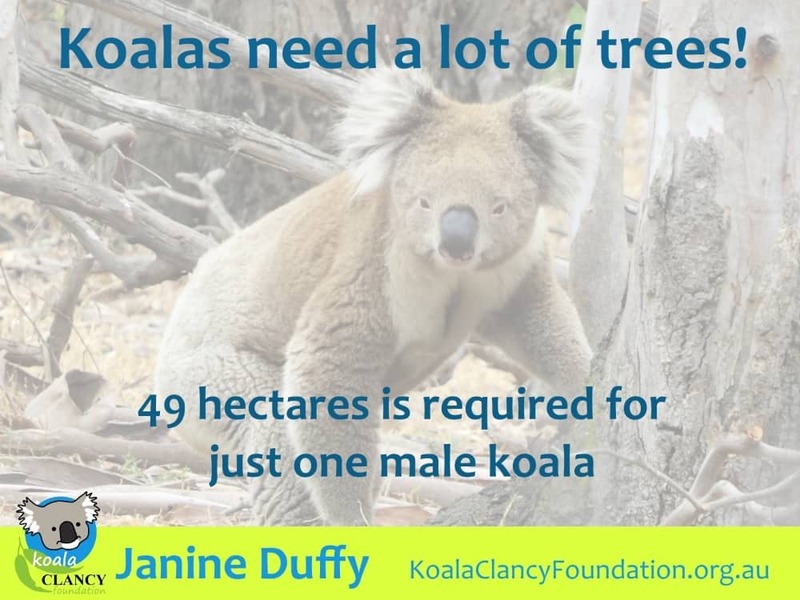 5) Rhind Susan G. , Ellis Murray V. , Smith Martin Lunney Daniel (2014) Do Koalas Phascolarctos cinereus use trees planted on farms? A case study from north-west New South Wales, Australia.. Pacific Conservation Biology 20, 302-312. 6) Echidna Walkabout’s Wild Koala Research Project, unpublished data.